910 - 21 Dallas Rd. "One of the city's most prestigious addresses"
This luxurious condo boasts over 3,750 sq. ft. of immaculate living space, with stunning views from every room. 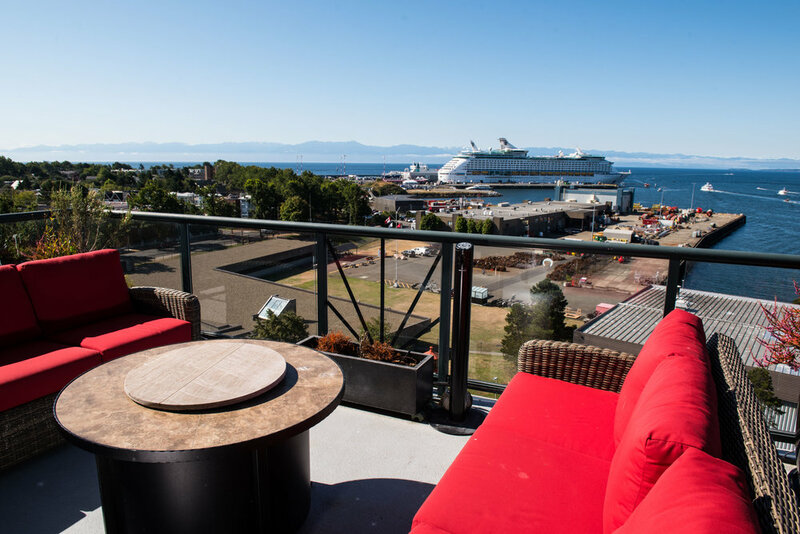 Floor to ceiling windows throughout, as well as five generous patios, provide a breathtaking backdrop of unobstructed views over the Harbour, cruise ship docks, open ocean and Olympic Mountains. The two master suites each include lavish ensuite baths and spacious walk-in closets. The kitchen is a chef's dream with a gas range, pantry, and charming breakfast nook with vaulted ceiling and sunny Western exposure. Bonus media room with full wet-bar. In-suite laundry, two parking spaces, and a massive storage room are also included. Elevator access directly into your home from the underground parking garage. Spectacular building amenities include a concierge, pool, fitness centre, workshop, putting green, and more. Stroll to Fisherman's Wharf or Downtown in minutes. An oceanfront oasis!